Hello all. To help me learn more about the SNES, how all the components are connected together, and how they interact with one another, I thought I would go ahead and create a schematic of the system's PCB. The couple that are currently available are pretty horrible. It's also helping me learn how to use the schematic capture software that I have. Would anyone find this useful or think it would be good to post? Or not really? Maybe there are some much better schematics that already exist that I just don't know about? If someone thinks it has value then where would be a good place to post it? I've only just started, but here is a screenshot. The screenshot isn't legible just because it's zoomed out so far, but the actual schematic when printed to PDF (or whatever) is ultra-high resolution. I am having to manually create all the nintendo custom components and having to define each individual pin so it's taking a while and is pretty tedious. But I have definitely learned a lot even with the little that I've done so far - so it's worth it. Also, _major_ credit to the nocash's fullsnes doc. It has been invaluable for getting all of the component pinouts, signal names, and pin numbers. 2017/09/26 - Fixed broken link! Last edited by jwdonal on Tue Sep 26, 2017 10:18 am, edited 3 times in total. I'd say it would easily be a valuable resource. You can start by posting up whatever you've got that's polished here. Then worry about adding it to the wiki or something. Would anyone find this useful or think it would be good to post? Please do! I spend about as much time deciphering and searching through the text on those scans as actually figuring out what's going on. I spend about as much time deciphering and searching through the text on those scans as actually figuring out what's going on. I know _exactly_ what you mean...because I've been doing that for 2 days now. Does any know where i can find some high resolution shots of the top and bottom of the 2nd revision of the SNES PCB? The one that moved the S-DSP and S-SMP chips from the separate SHVC-SOUND daughter board to the mother board? There is also the third revision which replaced the audio processing components with the S-APU single chip - I'm not interested in that one (since it has less behavioral detail). I've got several SNES's. If you have a low res pic or some other method for me to decipher what's what I can check what I've got and provide some good pitures/scans for you. - Internally, the entire audio system was on a seperate SHVC-SOUND daugterboard which plugged into the motherboard via a 24-pin I/O port. - Internally, the *digital* audio components (i.e. the S-SMP/S-DSP/64Kx8 SRAM) were merged into a single S-APU chip. Here are some pics for you for revisions 1/2/3/4. I scavenged these from "the internets". I take no credit for them. I think most of them came from snescentral.com if I remember correctly. I just added the annotations to point out the differences. If you could post some nice hi-res photos of the top and bottom of the 2nd revision PCB (hi-res enough that I can see the silkscreen lettering) that would be awesome. Let me know if you need any more info. EDIT: Added PCB revision names (thanks to hyarion!). EDIT2: Updated 2nd revision details. Last edited by jwdonal on Sat Jul 25, 2015 2:09 pm, edited 3 times in total. 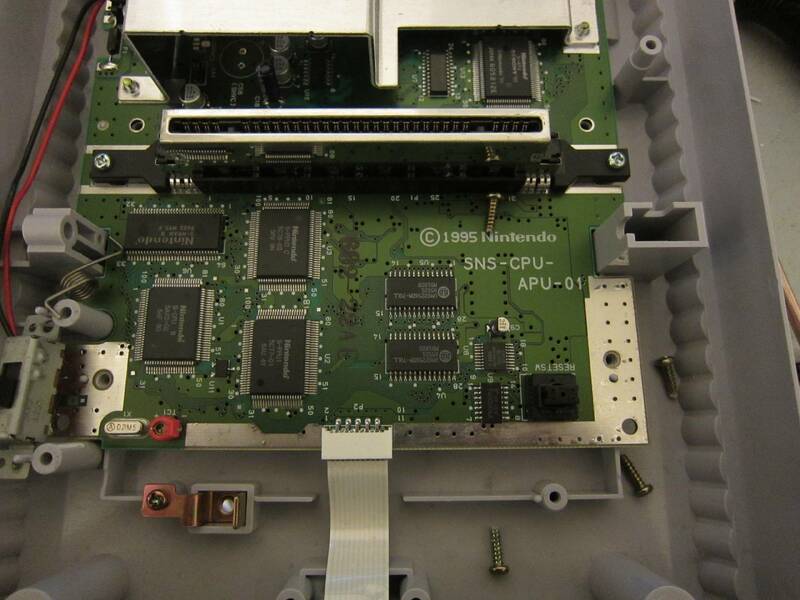 Are all third revision Super NES motherboards "1CHIP", or did that occur between the third revision and the SNS-101? I'm not sure if all of them are, but I have a 1CHIP 3rd revision console, so there are definitely rev3's with the 1CHIP, it's not unique to the SNS-101. Actually, I have all 4 revisions. I'll see if I can get photos. I have access to a flatbed scanner, so I should be able to get high-res, well-focused scans. So, I'm not sure if my full-size 1-CHIP board is the same one as jwdonal is referring to as rev 3, or if that's what tepples was referring to as the "revision between the third revision and the SNES-101"
Here are photos of rev 1 and 2. I still need to dig up my 1-CHIP and SNES Jr, but I'll post those as soon as I do. There are 2 shots of the bottom of the rev 2 board in order to get different lighting, since I couldn't get properly even lighting. Between the 2 photos, you should be able to read just about everything on the board. Unfortunately, the soldermask is too thick to see the actual traces. This is really cool! Thanks! Would you mind doing me a favor and renaming the files so it's easy to tell which picture belongs to which revision of board? Also, I'm still a ways off from being finished with the schematic, but I thought I would throw this question out now...is there anyone willing to look over these schematics for me and check it for obvious errors before I post a first draft? nocash has already volunteered but it would be nice if I could get a few people to check it over for me. The schematic is quite massive (along with all the pin definitions which I will also post) and it will require a fair bit of time for someone to check it over - so I understand if no one wants to volunteer. I assume you'll export something legible, instead of distributing Altium files. Yeah, just a simple (ultra-hi-res) PDF. I think there might have been one more revision. At least to the PCB between the 1Chip models and the previous, or rather revision 3 and 2 as you're categorizing them. It's labeled 1995 on the PCB so I know someone didn't swap out the pcb. It's from the killer instinct bundle, and it actually has really bad video quality, it's got really bad jailbars. I know the PCB layout is different because the video encoder is actually placed in the top right corner (looking at the snes from the front). On previous revisions it's in the bottom right. Can you elaborate a bit? What do you think the PCB difference would have been between those revisions? The PCB in the picture you're showing is what I have described in revision 3, that is, it still has all the chips separate except for the single-chip APU. Just the overall design. The placement of some of chips was moved around. On all revisions prior the encoder and chips seemed to all be in the same place. I'm not sure if there was any additions or removals of actual components, but they were definitely moved around. But there is definitely noticable degradation in video quality. It's absolutely terrible, and this is in comparison to some SFC's I've owned with vertical bars and jailbars. This has by far the worst picture of any SNES I've ever seen.